During the Christmas Holiday we were contacted by the Plants for People organisation - you might remember the item in a past Newsletter, when we used some of their research to illustrate the use of plants as health givers in the working environment. The upshot of the conversation was that we were invited to help them and the BBC in the preparation of a documentary! Early in January saw Mark and Pat, with clean and tidy uniforms, and a very clean and polished van, delivering plant displays to an office in Winchester. At this point we had little idea of what our involvement would be and whether we would appear, or just our plants. We were introduced to the Producer, Sophie Robinson, and her production team, along with Colleen Smith from Plants for People who was to give an interview based on research into Plants and their positive affects on the office/work environment. Sophie explained that the documentary had been made using some of the most exciting planted buildings in Europe, and that the Film - Bionic Buildings - was to show how various elements in the work place affect both the health and mood of workers. 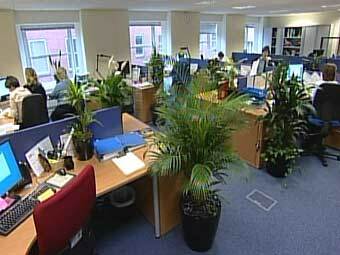 Our role would be to provide much needed planting to a small, contained office space. When we arrived the office staff were about to complete a tick-box questionnaire about their mood and general feelings on their work environment! Asking people questions about their frame of mind the first week after the long Christmas break didn't seem at all fair, and we thought that the plants would have to work exceedingly hard to give a feeling of wellbeing at that notoriously bad time of year! The Questionnairs completed it was our turn - Cue Lights/ Plants/ Van/ Decorfolia........not having seen the film yet we are unable to explain or describe how much of us you see, but we know that the Decorfolia van is filmed arriving, and in fast action Mark and Pat install the various plant displays, both floor standing and tabletop arrangements for the computer work-stations. It is at this point that we realised that this was a delivery unlike any other - there was no involvement by the ladies in the office. Many of you have had new displays delivered and generally there is plenty of discussion as to who gets which plant, and where the displays should stand... this time the office was quiet, everyone kept their heads down and you could hear a pin drop! From two fixed camera points they filmed the plants coming in (at least twice!) ah, the joy of filming. Then we did close up shots of cleaning leaves, watering the plants and adding decorative stones. Once the crew was happy with the film taken, we left and the plants remained to "lift" the post Christmas/New Year spirits of the staff - who then had to answer the questions again a week later. We do not know the final results of how much effect the plants had on the staff, but can tell you that the office looked fantastic when we left! So much so that the plants are now there on a permanent basis. Last week Sophie wrote to us to say that the programme had been completed, and the Decorfolia sequence proved to be a most enjoyable addition to the feature... The sight of Pat and Mark buzzing along like two Keystone Cops is the picture that comes to mind - However, we will let you make your own minds up on that point as we now know when the programme is to be aired - BBC 3 - Sunday 27 February 2005 at 7.00PM If you get the chance to watch it, please let us know your views. Of course, this isn't the first foray into the TV world for us, back in the mists of time we were asked to give a rather beautiful house on Calshot spit (near Southampton) an air of the Carribean, this was a "Tales Of The Unexpected" programme and we spent a whole week on "location" with Hayley Mills. Some time later we were asked to provide plants to decorate the set for the late Sir Harry Secombe, for the Sunday evening programme "Highway".